Checkout by Amazon is a payment method that combines your site's normal checkout process with Amazon's secure offsite payment information collection and verification. 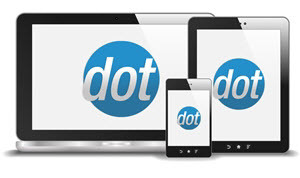 Customers initiate checkout on your site, and choose from your site's normal shipping methods on-site, but credit card information is entered on Amazon's site through a separate window that opens 'on top of' the store site. GO HERE to sign up for a Checkout By Amazon (CBA) account. 2. Put a check in the box next to Checkout By Amazon and then click the 'Submit' button at the top or bottom of the page. In versions prior to 9.4.2.0 you must first access the storefront and browse to the shopping cart page (there doesn't have to be anything in the cart). This will create the AppConfigs that will be edited in the next step. 3. In the Payment Methods Accepted section, click the 'configure' link next to the Checkout By Amazon entry. 4. 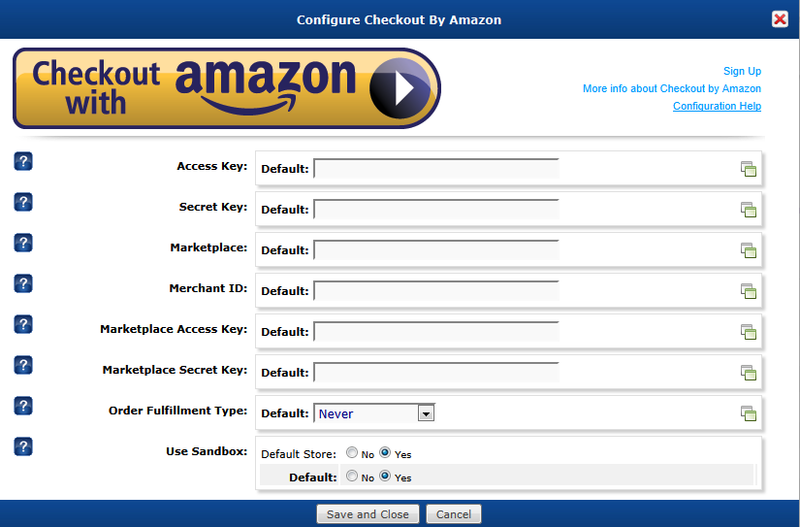 Put in the values you obtained from Checkout By Amazon for the 'Access Key', 'Secret Key', 'Marketplace', 'Merchant ID', 'Marketplace Access Key', and 'Marketplace Secret Key'. Instant - As soon as Amazon notifies the storefront that the order was successful (note that this can be up to several hours after the order is actually placed, as it takes time for payment to clear on Amazon's end). In this case, Amazon will notify the store that the order is ready to ship, and both the storefront and Amazon will automatically mark the order as shipped. MarkedAsShipped - This will mark the order as shipped on Amazon's end when you do so in the admin console. Never - The storefront will never notify Amazon's end of order shipping. All orders will have to be manually marked as shipped in Seller Central. NOTE: Currently this setting has no effect on the integration. Once the order is placed the cart does not call the Seller Central. All order updates must be set directly in Seller Central at this time. 6. Click 'Save and Close'. - CBA does not work in Basic One Page Checkout. It is supported in Standard checkout and Smart One Page Checkout. - The Checkout By Amazon integration currently does not support multiship orders. - After you create your basic Checkout by Amazon account through Seller Central, you will need to get a Marketplace Access Key & Marketplace Secret Key (used in step 3 above). There is no charge for this and it can be done through your Seller Central account, but those values are not generated automatically when you register, you must request them manually. - Order management actions such as Capture, Void, Refund, etc must be performed in both Seller Central and in the storefront admin console. They do not communicate with each other after the initial order is placed. - Orders placed through Checkout By Amazon cannot be edited. - Amazon has strict rules on how long they will allow each store to take to ship an item. If you do not mark orders as shipped within the time period they allow, Amazon will cancel the order and refund the customer. Make sure you are keeping up with orders in Seller Central! - Amazon requires that your site use an SSL certificate from one of the certificate authorities on this list for their callbacks. If you are using a cert from another CA, you will not be able to use Checkout by Amazon. - CBA is not a valid checkout method at this time on the Mobile version. NOTE: With Aspdotnetstorefront 9.2, billing address is not extracted from the IOPN notification. The billing address is extracted in version 9.3 and onwards.